Premium Sencha powder is popularly known in Japan as "Sushi Green Tea" because it is commonly served in better quality sushi restaurants. In the Japanese language it is called "hunmatsu" powder. Premium Sencha powder delivers the true taste of premium quality loose leaf tea leaves and is a product of 100% Shizuoka green tea. It is best mixed with hot or warm water as the sushi restaurants do. 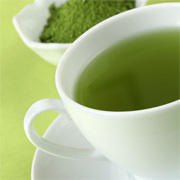 Premium Sencha powder is ideal for use at home, work or on-the-go. It is packed in a re-sealable foil package to maintain freshness. 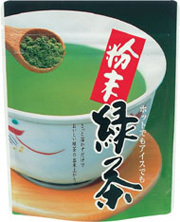 Please Note: Premium Sencha green tea powder dissolves immediately in hot water with very light stirring. It is soluble in cold water, but does not dissolve completely. You will notice small beads of undissolved powder at the top, which are not bitter tasting and very healthy. If not consumed right away, some of the powder will settle to the bottom or your cup, so simply stir again if desired.